Plug and play is a technology that allows users to connect devices such as printers or USB memory sticks to a computer and directly use them without installing any software. 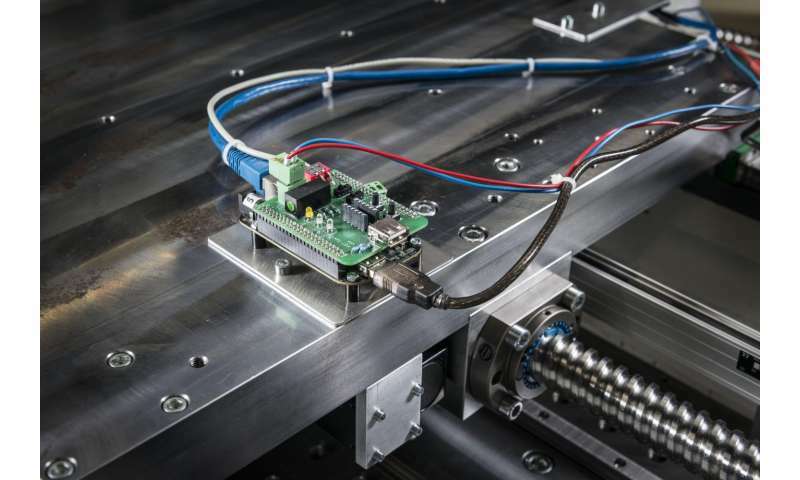 This technology is now also available for industrial applications: Engineers of Karlsruhe Institute of Technology (KIT) developed an adapter that makes it much easier to interconnect parts of a production facility and align them with each other. It allows a much quicker, more flexible and safer modification or extension of such facilities. "It was our objective to reduce the overhead required for commissioning components and entire production facilities," David Barton of the Institute of Production Science (wbk) of KIT says. The problem: Machines and parts that are part of an intelligent, networked production are supposed to exchange information on the current status of production, as demanded by Industry 4.0, but they often do not speak the same language or do not provide the required digital information at all. In addition, the facilities should be convertible so that individual customer demands can be met quickly and cost-effectively. The solution: Within the scope of the "Secure Plug and Work" project, the scientists developed an adapter that bridges communication gaps, for example between components and machine tools. "Our adapter transmits measured values and data as well as their meaning," explains Barton. "For data exchange and storage, we implemented current standards so that production-relevant information can be stored and transmitted safely," Barton says. "A small PC is used as an interface to connect sensors and actuators that convert their signals into mechanical movements." The computer combines the sensor signals with a description file to provide the network with up-to-date information on the component. This description enables the machine control to individually adapt to the components built into the machine tool. The adapter is equipped with an additional 'dongle' that confirms the authenticity of the components. "For production companies, it is now very easy to modify or extend a machine tool by connecting various components via a universal interface without running the risk that unauthorized persons can tamper with the production," Barton explains. In the "Secure Plug and Work" project, the wbk cooperated closely with the IOSB and ISI Fraunhofer Institutes and partners from the industry: MAG, Steinmeyer, Kessler, Romai, Schunk, MOC, cbb, and Wibu. The researchers had the opportunity to test the adapter in various real-world use cases. The Federal Ministry of Education and Research funded the project with approx. EUR 2.5 million. From September 18 to 23, the wbk will present its plug-and-work approach at the EMO (international machine tool exposition) in Hanover (Germany).